Osakishimojima is one of more than 700 islands set in the tranquil Seto Inland Sea, known for its early morning fogs, late afternoon mists, and the mesmerizing interplay of light and color of the sea’s water and sky. Located in the western half of the sea, it is a modest-sized island—large enough to be lined with steep mountains and narrow valleys yet small enough to be tucked away amid a cluster of other islands. Because of its sheltered location and gentle climate, Osakishimojima was once a busy maritime trading center and Japan’s leading producer of citrus. The legacy of these more prosperous times are the small towns, villages, and ports on the island, their ancient Shinto shrines, and shops and homes from the Edo (1603-1868), Meiji (1868-1912), Taisho (1912-1926), and Showa (1926-1989) eras. The old port of Mitarai on the island’s calm inner harbor is, itself, a veritable museum of some of the best-preserved historical architecture found anywhere in Japan. The harbor is hardly used now, however, because, like so much of Japan’s countryside, Osakishimojima’s economy has been in the doldrums in recent years. In order to help her community, Atsuka Uegami began making marmalade 17 years ago after hearing that Japan’s central government was promoting the development of new local products as a grass-roots way to revitalize the countryside. She uses the wide range of citrus—dekopon, amanatsu, haruka, ponkan, lemon, and others—that she grows in her home garden in the tiny village of Kubi on the southern side of Osakishimojima and at small orchards scattered in the mountains closer to the coast. A spry octogenarian, Atsuka shuttles between the properties in a miniature white pickup truck at speeds that leave most other drivers behind, maintaining the orchards by pruning the trees, slashing back the tall grasses that grow beneath them, and wrestling with the wire fencing she uses to keep wild boars out. She does this alone nowadays because her husband passed away nine years ago and her only daughter a few years after that. Atsuka does have help in the local school kitchen she uses to make marmalade, having invited two of her friends to join her. The marmalades they concoct are completely hand-made, all-natural, with no additives, and feature the best fruit from Atsuka’s orchards. Because the citrus the women use is milder and sweeter than the astringent Seville oranges classically used to make marmalade (or the Seville orange's local cousin, the daidai, which is native to East Asia and grown in Japan), they have had to teach themselves how to make marmalades that are slightly sour and bitter according to Western taste. They have also been adding whiskey to some of their batches, after hearing that this is what marmalade makers in Britain do. Seen from a ferry stop on neighboring Osakikamijima Island, the entrance to Osakishimojima’s main harbor is under the bridge that connects two small islands located just in front of the island. The Utsu Shinto shrine in the town of Ocho is believed to be over 2,000 years old. Mitarai’s main street, located just behind the port, is lined with Edo-era (1603-1868) shops and homes. Atsuka’s pluck is typical of the Seto Inland Sea’s island people, who are known for being non-conforming, ambitious, and welcoming to strangers. The Tokugawa Shogunate felt so threatened by them that when it unified Japan in 1603, it redefined the Seto Inland Sea and its islands as “the other”—dangerous, forbidden places, whose only value lay in serving the new social order of a land-based, totalitarian society ruled from Tokyo in the north. In the Edo period, the Tokugawa Shogunate established the port of Mitarai in the inner harbor at the island’s eastern end. Here, Japanese merchants could trade with foreigners. Only slightly less provocatively, this is also where a rowdy pleasure district of geisha o-chaya teahouses and oiran houses of prostitution was allowed, where, in backrooms, the feudal lords of western Japan proved the danger of “the other” by successfully plotting the overthrow of the Tokugawa regime in 1868. In the 19th century, after the fall of the shogunate, Japan’s prejudice against its offshore islands persisted, and Osakishimojima became a food production center for the rest of the country, as did many other islands of the Seto Inland Sea. Osakishimojima was Japan’s “citrus island.” Taking advantage of the calm air, strong sunlight, light rainfall, and good mountain drainage, which is so important to citrus orchards, ishizumi stone terraces were built on which all kinds of citrus were grown. The most famous of these were mikan oranges. By 1935, Osakishimojima was supplying 40% of the mikan consumed in Tokyo, with the price of three crates of mikan being equal to a bureaucrat’s monthly salary. 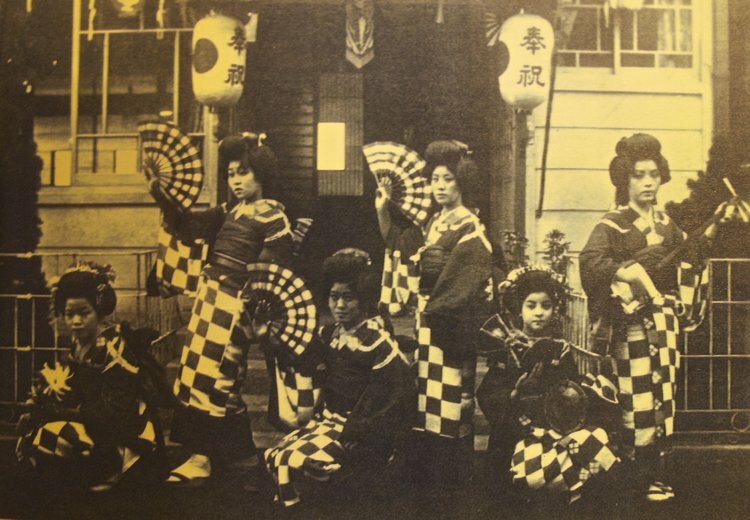 When prices fell and prostitution was criminalized after the war, Osakishimojima’s economy collapsed. In more recent years, the island has suffered from a declining population due to its aging demographic and a steady migration to cities on the mainland. Despite the challenges that Osakishimojima has faced over the centuries, its rich history and then benign neglect have blessed the island with a range of resources with which its residents are currently working to revive the island’s fortunes as both a place to live and to visit. These resources include its well-preserved historical architecture, citrus groves that are as famous for their mild, sweet lemons (lemons were first grown in Japan on Osakishimojima starting in 1898) as they are for their mikan, and the island’s remote peacefulness. One of the Edo-era merchant trading houses in Mitarai where the overthrow of the Tokugawa Shogunate was plotted. And during its heyday as a trading port. Wakaebisu-ya, formerly Mitarai's largest brothel. And the women who used to work there. Stone terraced-orchards glow with mikan. The historic port of Mitarai as seen from Okamoto Island on the other side of Osakishimojima’s inner harbor. Atsuka Uegami in the island’s Mikan Museum, located in the town of Ocho. Jane Hasell-McCosh welcoming visitors to the marmalade awards and festival held annually at her home, Dalemain Mansion & Historic Gardens, in Cumbria, England. Marmalade may seem an incongruous food to restore the fortunes of a remote Japanese island. But owing to Japan’s largely semi-tropical climate, the country is blessed with one of the most diverse, exotic, and extensive ranges of citrus in the world, and marmalade, in turn, is very Japanese in its culinary attributes. For one, it is an easy and rewarding food preservation project for home cooks. One simply cuts up the peel, squeezes out the juice, puts the pulp in a cloth bag, and boils everything together with sugar. The natural pectin in the peel and seeds helps the marmalade gel, and the sugar acts as the preservative. Because the entire fruit is used in the process of making marmalade, it appeals to the Japanese sensibility of mottainai—not wasting a thing. The finished product is equally appealing. Marmalade has aroma, texture, and a complex flavor that combines sweet, sour, bitter, and umami—citrus having more umami than almost any other fruit. Because of these flavor characteristics, marmalade is widely used in Japan as a seasoning and flavoring when cooking. Not only in sweet confections but also in savory dishes, especially meaty ones in which marmalade’s acidity helps to tenderize the meat, its bitterness counteracts the dish’s richness, its umami deepens its flavor, and its fruitiness provides a delicious accent. There is also, of course, the universal joy of a home filled with the scent of citrus when cooking the fruit, not to mention the pleasure of eating one’s own marmalade spread on a slice of hot buttered bread, or the even more decadent delight of eating it directly from the jar with a spoon. Atsuka’s favorite marmalade is her lemon marmalade because of the quality of her fruit. In addition, lemons offer the advantage of a good gel because they have pectin in their juice as well as their pulp and peel. Lemon’s high acidity also helps to preserve the marmalade. Atsuka adds a touch of whiskey at the end to mellow the marmalade’s flavors and give it an English flair. A deliciously rich, thin-cut marmalade, with a delicate chew, flowing spread, and the transparent glow of golden sunshine, it is a popular-selling product at local shops and at the TAU store in the Ginza, which is Hiroshima’s Tokyo “antenna shop” showcasing the best artisanal foods and crafts made in the prefecture. In 2017, Atsuka and her friends felt confident and brave enough to enter their “Lemon Marmalade With Whiskey” in the annual marmalade contest held at Dalemain Mansion in Britain, and won a Bronze Award in the Octogenarian category of the Homemade Marmalade class. Publicity followed, and Atsuka was featured on local and national Japanese television shows, which, in turn, led to orders for her marmalade from all over the country. Moreover, Atsuka won over Jane Hasell-McCosh’s heart, who tells the charming story of how Atsuka attached a note with her marmalade asking for forbearance because one of her friends, who helped make the marmalade, did not meet the qualifications of the Octogenarian category, being only 79 years old at the time. The following year, in 2018, Jane visited Osakishimojima to meet Atsuka. Jane’s trip also resulted in the creation of a sister competition in Japan, the first annual “Japanese Marmalade Awards” to be held in Yawatahama City on Shikoku Island in May 2019. Since winning the award, Atsuka has become an ambassador for Osakishimojima, regularly traveling around Japan to promote her marmalade and the island’s delicious and unique citrus. She is also currently busy teaching a new generation of cooks on the island how to make marmalade. For Jane, Atsuka’s story is one of the “astonishing marmaladic things happening all over the world” as a result of the marmalade awards. The fun and eccentric awards are meant to not only update marmalade with new, original recipes and uses and, thereby, preserve a food tradition, but to also enrich people’s lives by celebrating home cooking and fostering a global community of people who cook and eat well. These aims have often had surprising results, such as the renewed purpose and appreciation of the way of life on a remote island in Japan’s Seto Inland Sea. Atsuka in her lemon orchard with Mai Miyagawa, a new local resident who moved to Osakishimojima four years ago and who Atsuka is training to become the island’s next generation of marmalade makers. A torii gate facing the inner harbor marks the approach to the Ebisu Shrine, which is dedicated to the Shichifukujin, or Seven Gods of Fortune. The two main towns on Osakishimojima are the historic port of Mitarai, which is one of only two towns in Hiroshima prefecture that is designated a Significant Cultural Streetscape by Japan's Agency for Cultural Affairs, and the larger, nearby port of Ocho. Older than Mitarai, Ocho has always been the island’s main market town and was also its trading center during the island’s citrus-producing heyday. 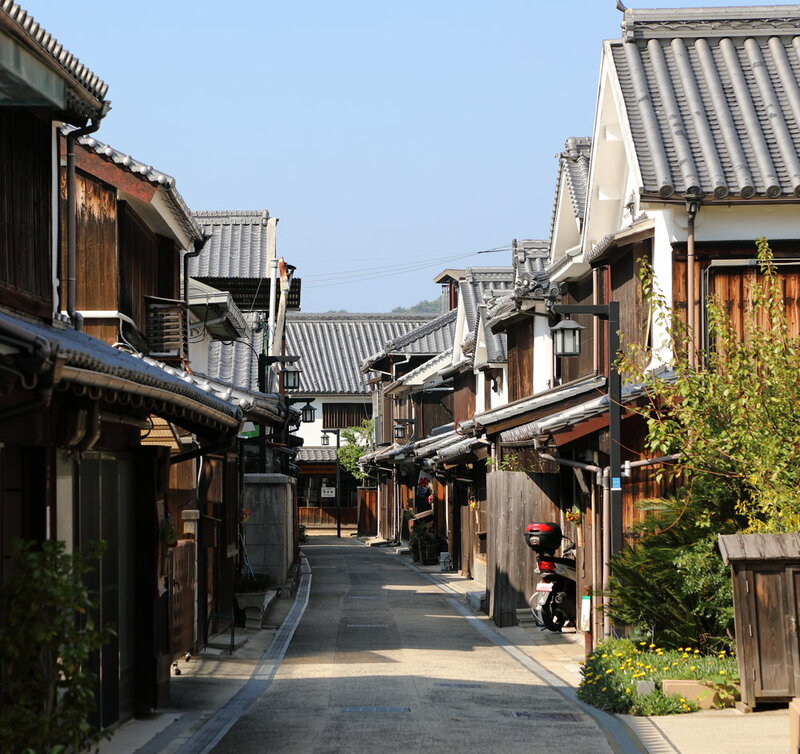 While not as well-preserved as Mitarai, its back streets are filled with equally eclectic old shrines, shops, and homes. Ocho is also the home of the island’s interesting Mikan Museum and the base for ferries to the island. Its shops and restaurants are open throughout the week. At Mitarai, on the other hand, most places are typically open only from Friday to Sunday, or a day or two longer, depending on the season. Check before you go. A small visitor center located at the northern entrance to Mitarai is a helpful way to start exploring the town. You can easily explore Ocho and Mitarai on foot. The rest of the island can be seen by bicycle, local bus, taxi, and car. Osakishimojima is part of the Tobishima Island chain, which is connected by a series of bridges that starts from Kure City on the Honshu Island mainland. It is a beautiful route that can be travelled by local bus, car, or bicycle. Kure City can be reached by switching from the Sanyo Shinkansen bullet train to the local Kure Line at either the cities of Mihara or Hiroshima. Another equally stunning way to get to Osakishimojima is by the ferries that arrive from the mainland and other islands at two different terminals in Ocho—the main terminal for larger ships and another one nearby for smaller boats. One of the best options are the small ferries that come from Takehara City on the Honshu Island mainland. There are six ferries per day, and the 40-minute ride brings you to the smaller terminal at Ocho, which is only a 10-minute walk from Mitarai. Takehara is the other location in Hiroshima prefecture designated a Significant Cultural Streetscape by Japan's Agency for Cultural Affairs. It is also well-worth visiting, and has the services that can make it your base to tour the region. The small boat that runs between Ocho’s small ferry terminal and Takehara City on the Honshu Island mainland. Osakishimojima has a number of delightful restaurants scattered around the island serving home-cooked specialities like okonomiyaki pancakes and a growing number of stylish cafes and fine dining places. At Akechi an elderly couple make okonomiyaki for take-out or to eat there in their kitchen where they cook. The Miharashi shokudo (diner) in Mitarai is a fun place to have lunch, especially when it’s full of local residents. Open daily, it's easy to navigate as plates of food are laid out on shelves; you simply pick up what you want and hand it to the cook who reheats it if necessary. They also have a regular menu of such standbys as ramen and chahan (fried rice) that you can order. There are few places to stay on the island, although that is changing with the recently opened upscale Shintoyo Ryokan and Kusushi Guesthouse, which offers a hostel kind of experience. And winter hotpot of oden. The home cooks at Akechi making okonomiyaki pancakes. Located adjacent to Ocho’s main ferry terminal, Neroli no Shima is both a delightful cafe and a distillation facility where pure, high-quality perfumes, essential oils, and beauty products are made using the peel, flowers, and leaves from local citrus. The business was established by Mayumi Yazu working together with the local agricultural association and one of Japan’s leading scent experts to develop a new use for the island’s citrus, especially the discarded peel from citrus used to make juice. Light meals, snacks, and refreshments are offered at the cafe, while the distillation facility sells its products and also offers workshops where visitors can make their own essential oils based on whatever citrus is in season. Mai and Tom Miyagawa Coulton have been active island supporters ever since they moved to Mitarai from Tokyo four years ago. Mai’s first job was strategist and liaison officer for Osakishimojima’s inbound tourist programs, while Tom continued to work as a photographer and film maker. A month ago, they opened The Tea Cosy in Mitarai’s old post office, where Tom also has his studio, to offer visitors a place to take a break from sightseeing and enjoy English tea, homemade scones, jam, and cream, and on occasion, lemon drizzle cake. They learned how to make their delicious scones from a family friend back in Tom’s hometown in England, who is known as the “Scone Master of Devon” and is also the main judge at the annual scone baking competition sponsored by the Women’s Institute of the U.K.
Shintoyo is housed in a beautifully renovated 100-year-old ryokan on the harbor in Mitarai. Opened a year ago, it is the newest project of Akira Inoue, a local resident who has saved a number of Mitarai’s old buildings by turning them into cafes, restaurants, and guesthouses (including the Kusushi Guesthouse). Shintoyo’s restaurant, which you enter from the harbor side of the building, serves a selection of fresh seafood set lunches on Saturdays, Sundays, and holidays. The head chef is Masanori Shinozaki, who was hired away from Tencho Katsura-tei on nearby Teshima Island, which until the opening of Shintoyo was considered the best seafood restaurant on the Tobishima Island chain. Dinner is only for overnight guests who stay upstairs at the inn, which you enter around the corner. The well-appointed rooms include a large lounge area facing the harbor and two bedrooms with Western beds. The inn is designed to accommodate one group of up to four people per night. Chef Masanori Shinozaki in front of Shintoyo Seafood Dining Restaurant. A set lunch of freshly caught tai (sea bream) served raw over a bed of rice at Shintoyo. Shintoyo’s owner Akira Inoue at the side entrance to the inn. The private lounge at the inn. Another of Osakishimojima’s enterprising elderly citizens is Kazuko Nakamura, who created a recipe using the island’s sweet mikan oranges as the base for a savory paste that combines locally-made miso, dried niboshi sardines, sesame seeds, garlic, and other seasonings. It is surprisingly delicious, as well as versatile, and can be used as a topping for warm rice and cold tofu, blended into salad dressings, added to soups, curries, and stews, and spread as a glaze on grilled vegetables and meats. Kazuko and three friends make 2,000 jars a year at the same school kitchen in Kubi that Atsuka uses to make her marmalade. It is sold at the Mitarai visitor center and a number of other locations on the islands. The Seto Inland Sea has become a mecca for cyclists in recent years, with the Tobishima Islands being a particularly favorite route because of its gentle paths and the quiet rural calm, charming towns and villages, and spectacular scenery. The Tobishima Islands, including Osakishimojima, were featured in a number of scenes in the “Salt” episode of the Netflix series “Salt, Fat, Acid, Heat” for which we at Oishi So Japan acted as local food guides and production coordinators. If you’d like to see where Chef Samin Nosrat learned to make moshio seaweed salt, stop by the Amabito no Moshio saltworks on Kami-Kamagari Island.